What do you do when you're a stay-at-home-mom to three daughters born within four years? If you’re Robin O’Bryant, you write about it. Her weekly column called Robin’s Chicks quickly became a must-read for mothers and the basis for her hysterically funny new book. Robin O'Bryant tells the stories of motherhood exactly as they are — no details left out. 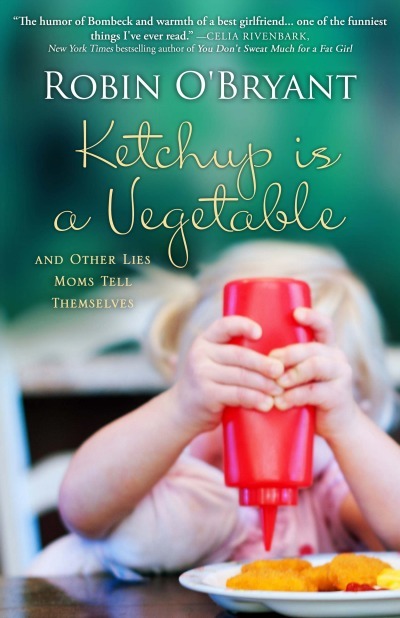 Her new book Ketchup is a Vegetable and Other Lies Moms Tell Themselves is hysterical. She is just as funny in person as she is on paper and we had the chance to ask her a few questions recently. Robin's honest and humorous approach to motherhood has us fist-pumping and smiling. We asked her when she started writing, and if her plan always included a book. "I've always wanted to be a writer. I always had my nose in a book as a child and spent all my money on notebooks, pens and books. I was never drawn to writing fiction but I journaled like I thought I was Anne Frank. I never knew what to write about until I had three daughters in four years. Do the math. That's a lot of crazy." "We were moving every two years with my husband's work and I started sending almost daily emails to my family to help them keep up with my kids. I realized when they started forwarding the emails to all of their friends that I had found my subject matter." "I started outlining Ketchup and the blog around the same time. I knew to sell a nonfiction book I was going to have to have a platform and that was the natural place to start. About 3 months later I emailed the editor of my, then, local paper and pitched a family humor column. She liked the idea and my first humor column started running in the Moultrie News in Mount Pleasant, South Carolina — it still runs there today." Raising three young daughters isn't easy. We asked Robin her advice for staying organized and ahead of the little people. "Give up now. Accept defeat." "Wasn't that incredibly encouraging? I'm completely serious though. You can not get it all done. You will never have every laundry basket in your house empty, every toy picked up, the fridge cleaned and stocked, dinner on the table, homework done and your legs shaved at the same time. It is impossible and anybody that tells you differently either has a nanny, a maid and a whole lot of money... or is a complete liar." "So cut yourself some slack. Decide what is important to you and what isn't. Deal with what is most important every day and let everything else go. Realize that it's okay to climb into an unmade bed at night and wear the same yoga pants for three days in a row. There will be a time in your life when your kids won't need you as much. In even better news? There will be a time in your life when your kids are big enough to push a vacuum and unload the dishwasher and you won't be so overwhelmed." Writers sometimes face topics they are dying to write about, yet worry that they are over-sharing with their readers. We wondered if anything is off-limits for Robin? "I never write anything that would jeopardize any relationship in my life. In Ketchup, I share a lot of moments about my kids that will probably embarrass them at some point in life. But that stuff is pretty standard, growing up, everybody did it kind of stuff. As they get older things are different. We are talking about more serious topics and there is a lot that I won't write about. I have had some hilarious conversations about puberty with my oldest daughter and maybe when she's in college or married and gives me her blessing — I'll write about those stories then. But I would never write about them now." Robin's hilarious book is also available in a Kindle version and with a companion volume called A Second Helping. She blogs at Robin's Chicks.